The Biasi BoilerMag Magnetic Filter is designed to protect your heating system‚ adding years to the life of your boiler‚ reducing energy bills‚ carbon emissions and maintenance costs. The Biasi BoilerMag incorporates high performance with ease of installation and servicing. Tried and trusted patented magnetic technology ensures that virtually 100% of ferrous oxide or magnetite is removed from your heating system. The patented technology ensures that the unit does not block even when fully loaded with contamination. Without a magnetic filter debris from your heating system can cause blockages in your boiler‚ resulting in breakdowns‚ reduced efficiency‚ poor performance and cold spots on your radiators. 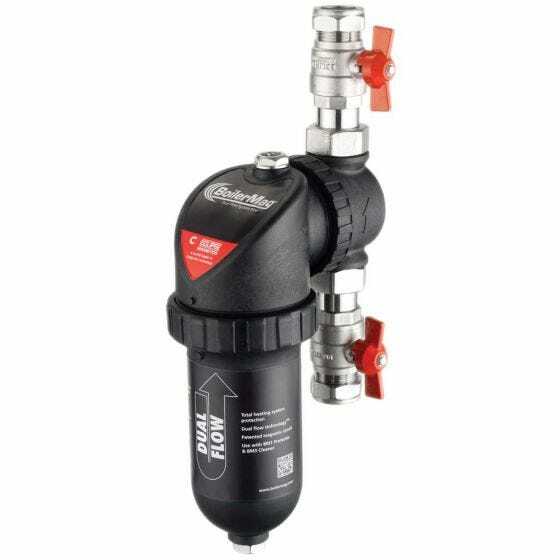 The premier performance of the Biasi BoilerMag Filter means you can install and clean in minutes‚ it has a unique dual flow technology and 360 degree orientation to ensure it can be fitted in almost any domestic pipe configuration. The Biasi BoilerMag has a 25% bigger magnet than other leading brands and boasts market leading extraction rates. Biasi BoilerMag filters come with a 3 year warranty subject to terms and conditions which can be seen here.